Q. How can I find online foreign language dictionaries? To find foreign language dictionaries, try a subject search within HoyaSearch Advanced Search. 1. Change "Any field" to "Subject"
2. 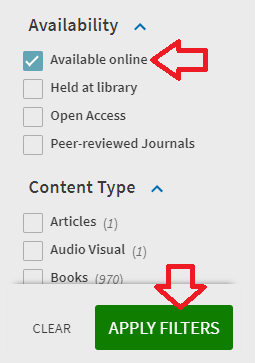 Change "contains" to "is exact"
If you want an online language dictionary, you can limit to "Available online" on the filters on the left side of Hoya Search. If your looking for more language-specific resources, check out the research guides!